Recent Gifts from the Corcoran Gallery of Art introduces several works given to The Kreeger Museum as part of the Corcoran Collection Distribution. The addition of these works to the Permanent Collection adds depth to the narrative of modern American painting and sculpture in the 20th Century and Contemporary Galleries. Helen Frankenthaler’s monumental Hurricane Flag hangs prominently above the main staircase, and works by Clark Fox, Joan Mitchell, Anne Truitt, and David Urban are now on display in the Museum’s Lower Level. Also included in the gift are works by Mark di Suvero, Andre Derain and Maurice de Vlaminck. The Corcoran Gallery of Art was one of the first private museums in the United States, established in 1869 by William Wilson Corcoran and expanded in 1880 to include the Corcoran College of Art and Design with the mission ‘dedicated to art and used solely for the purpose of encouraging the American genius.’ In 2014, the Corcoran transferred the college to the George Washington University and distributed the works from its Collection to museums and institutions in Washington, D.C. Guest curated by modern art historian Harry Cooper, the reinstallation introduces works that have not been on view for several years, while offering fresh perspectives on collection favorites. Phase II of the reinstallation of the permanent collection opens in the lower galleries on September 4, 2018. This phase of the reinstallation focuses on the Museum’s postwar and contemporary art holdings, including a bold vertical canvas by Abstract Expressionist Hans Hofmann, which has not been displayed for several years. On view for the first time are new works by Paul Reed and Willem de Looper. The lower galleries also highlight the Museum’s outstanding collection of African masks. Phase I of the reinstallation, which opened September 19, 2017, comprises the Museum’s main floor galleries and focuses on 19th- and early 20th-century painting and works on paper. Objects on view for the first time in several years include an early portrait by Edvard Munch, two winter landscapes by Impressionist painter Alfred Sisley, a mature pastoral scene by Jean-Baptiste-Camille Corot, and a signature Surrealist landscape by French painter Yves Tanguy. Image: Hans Hofmann, Elongation, 1956, Oil on board, 71 1/2 x 17 1/2 inches, The Kreeger Museum. A multi-media group exhibition of Portuguese art of the 21st century, Second Nature is both a portrait of recent artistic production in Portugal and an exploration of the relationship between human culture and the environment. Working in media ranging from watercolor to photography to video, artists in the exhibition consider the tension between the concept of an untouched natural world—a popular subject in art history—and the ways humans have dominated and reshaped the environment using modern technology. 2017 marks the 50th anniversary of the completion of The Kreeger Museum building. It was designed by world famous architect, Philip Johnson, in 1964 and completed in 1967. The Museum has asked two prominent Washington architects, Michael E. Hickok, FAIA and Yolanda Cole, FAIA, of Hickok Cole Architects to conceive and curate a special exhibit celebrating this occasion. The Kreeger Museum presents an intimate special exhibition, JOAN MIRÓ From The Collection of The Kreeger Museum, January 21 - February 25, 2017. 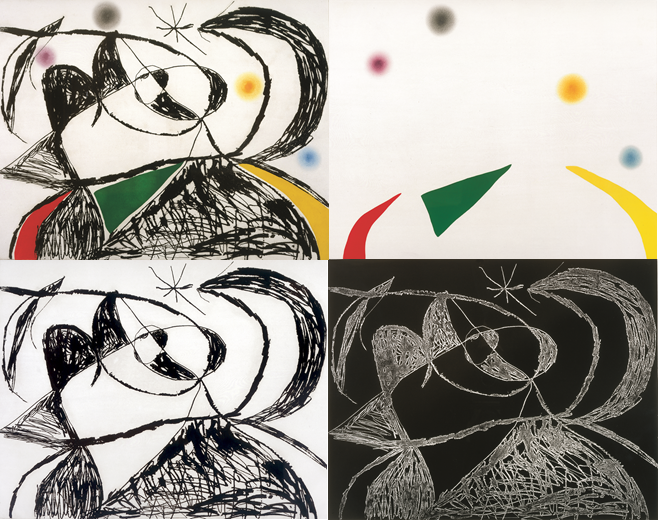 The Kreeger’s complete collection of works by Joan Miró will be on view, including The Mallorca Suite, Makimono, and El Vol de l’Alosa (The Flight of the Lark). Joan Miró was the consummate professional artist, a perfectionist, who insisted he was a “self-taught amateur” in order to secure for himself permission to transgress traditional techniques – to experiment and improvise – especially in pursuit of printmaking as a medium for his breathtaking expressions of devotion for Catalan culture. His beloved Mallorca, the sunlit island where he lived and worked after 1940, was the subject of such inventiveness. Purchased in 1973 by David and Carmen Kreeger when they attended Miró’s 80th birthday celebration in Palma de Mallorca, The Mallorca Suite is an unconventional masterpiece by one of Spain’s greatest artists, and The Kreeger Museum is believed to be the only place in the United States where a complete set of the suite may be seen. Added to the set are color states of each etching, black states and technical (or reverse) prints. Inclusion of these decompositions offers viewers the exceptional opportunity to see the work evolve, as the artist himself did in 1973. Miró saw on the pages the familiar faces of people who lived and worked, as did he, on this Mediterranean island. We are not meant to recognize them; we are only to experience delight in scrutinizing the emergence of visages we shall never know but will never forget. The etched title page and a full color gouache painting puts the exclamation point on the entire display that is The Mallorca Suite of 36 images by Joan Miró. Thirty-six feet long and 16 inches wide of specially woven raw Lyon silk, printed with lithographed and etched designs from Miró’s original wood and metal blocks, impressed with lustrous colored inks – this is the basic description of Miró’s tour de force, Makimono, the execution of which took five years from conception to completion in 1956. David Kreeger purchased Makimono along with its incised and lacquered oak box in 1965. Inspired by scrolls of Asian art, Miró fused that Eastern spirit with a dynamic nod to primitive images of the West to create his exquisite modern Makimono. Meant to be read from left to right as it unfolds, it is told calligraphically in bright, joyous notes of symbols and colors which pronounce traditions of Catalan: crimson, black and yellow of the flag; green of the carob tree and the evergreen – metaphor for the Catalan nation; the star/asterisk – a symbol of Catalan separatism.The biomorphic characters are engaged in a dramatic narrative that the viewer cannot truly decipher. It is up to us to catch this joy ride with Miró’s inventive imagination. “I make no distinction between painting and poetry. It therefore happens that I illustrate my canvases with poetic phrases and vice versa.” Inevitably his creative wanderlust led Miró to produce books, especially to illustrate the work of the many poets who had become his friends. In 1973, as a contribution to the festivities that were being prepared for his birthday commemoration, he completed a notable edition of El Vol de l’Alosa to celebrate the works of nineteen Mallorcan poets. Specially commissioned for this project was the Guarro paper and also specially conceived for it was Miró’s own signatures figured into the watermarks on each sheet of the book. For each poem he executed a unique graphic sign and to hold the unbound sheets, a cloth box – in black on red (symbolizing Spain) and black on blue (symbolizing the sea around Mallorca). Even the type characters were specially made in Bodoni 12 and melted down after this one use. Miró decided that the poets deserved an even greater tribute, so he cut a new lithograph as a memento – original black printing with colors added by his own hand. It is this complete assemblage that the Kreegers purchased, in addition to The Mallorca Suite, when they visited Palma de Mallorca. JOAN MIRÓ From the Collection of The Kreeger Museum will be on view January 21 through February 25, 2017. To celebrate the opening of the National Museum of African American History and Culture in September 2016, The Kreeger Museum presents selected works from the permanent collection by Sam Gilliam and Simmie Knox. The Museum's relationship with both artists dates back to the early 1970s when David and Carmen Kreeger purchased their works. Sam Gilliam: The Kreeger Museum opened in 1994; the first exhibition at the Museum was Sam Gilliam 3-D (1998). John Beardsley, guest curator of that exhibition, wrote of Gilliam: "He is among the nation’s most accomplished abstract painters. Over the decades, he has not wavered in his commitment to a rigorous but exuberant modernist style..."
Simmie Knox: In 1971 David and Carmen Kreeger purchased a work by Simmie Knox which had been shown in the Thirty- Second Biennial Exhibition of Contemporary American Painting at Corcoran Gallery of Art. This early abstract diptych by Knox illustrates his love of color and the movement of color. SMITH | PALEY is the first exhibition to feature a collaboration by internationally renowned artists Clarice Smith and Albert Paley. Triptych(2016) was the inspiration for this exhibition. SMITH | PALEY features a selection of Smith's paintings, including a five-panel screen Gallop; and a selection of Paley's sculptures, including maquettes for the project documented in Albert Paley on Park Avenue. October 26: Creative Power - a provocative round table discussion with Clarice Smith, Renee Fleming, Peggy Cooper Cafritz and Arthur Bloom. November 9: Susan Stamberg in conversation with Clarice Smith and Albert Paley. Celebrate Women's History month! The Kreeger Museum Contemporary Sculpture Garden, open Tuesday through Saturday 10 to 4, is graced with works by five women sculptors. Works currently on view in the Contemporary Sculpture Garden include Ledelle Moe's Transitions/Displacements (above), 2011-12 concrete and steel and works by Dalya Luttwak, Carol Brown Goldberg, Kendall Buster and Wendy Ross. Early modernist art in Flanders was dominated by an interest in expressionism comparable to similar investigations throughout the rest of Europe. The art and artists that represent the achievements of Flemish Expressionism, however, remain largely unknown to audiences outside their native land. Flemish Expressionism | A Modernist Vision, seeks to address this imbalance in European art history. Drawing upon the rich holdings of a remarkable and never-before-exhibited private collection, the exhibition traces the history of Flemish expressionist painting, sculpture, and graphic arts from James Ensor to the School of Sint-Martens-Latem and its successors. Exhibition curator David Gariff contextualizes Flemish Expressionism with European works in the The Kreeger Museum's permanent collection.